I never cease to marvel at the wonders of God's work, clearly revealed in nature. I thank God for beauty in nature, God is indeed the greatest Artist in the world. He created all things in perfection and overwhelming beauty, everything everywhere is an expression of utmost glory and majesty at the very depth of His thoughts.Every creation of God is wonderful and perfect. Have you ever walked into a garden with wonderful flowers, and their scintillating fragrance...? You will fall in love with nature at it's best. There is another dimension of nature you experience when you climb and approach the summit of a mountain. This is part of the beautiful taste of nature. 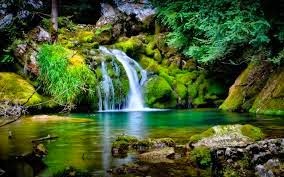 I have been to a couple of streams and even swam in some, I have climbed one or two hills or mountains although they are little compared to the vast wonders of nature which still lie ahead of us in different parts of the world to be discovered!yet, I am indeed grateful now and always for all of God's work in nature! Time will fail me to mention to the very last details all the great wonders of nature....wonderful songs of birds,colourful butterflies etc.. they are best experienced than imagined! I thank God for nature!